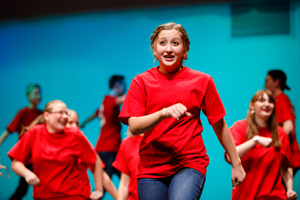 Youth, ages 8-18*, participating in these workshops will spend 4 months training in acting, voice and dance, and 4 months applying what they have learned as they rehearse for the spring musical. The fall semester is a series of workshops. Each Wednesday, participants attend three 45-minute classes: Acting, Dance, and Music. They will be taught age-appropriate skills in each area. These skills will be built upon weekly, and students will apply them immediately as they prepare for a recital-like performance — the December Showcase. In addition, youth who have been in the program for 5 or more years will participate in special numbers for the December Showcase. This requires additional rehearsals on some Saturdays. This is the perfect opportunity to completely apply the skills taught in the fall semester and give every student a chance to be a star. This year’s spring show is “My Son Pinocchio Jr.”. *Seven year-olds who have participated in Broadway Bound for one year are also be able to sign up. Dates and Times: Classes and rehearsals will be held each Wednesday from 4:00-6:30 p.m. at the Pleasant Grove Lions Club. Classes will begin on September 6, 2017 and continue through April 2018. 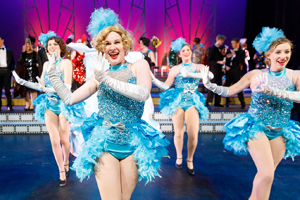 We will be performing our spring show at the Covey Center in Provo during the last week of April. Cost: Monthly tuition is $75. In addition, there is a non-refundable registration fee of $75 that covers the cost of materials, scripts, music, etc.